This streamlined holster bag is for travel, sports and outdoor photography. Carry it on the non-slip shoulder strap, a belt or an optional Topload Zoom Chest Harness. It includes a reverse-open lid for fast access, front zip pocket, inner mesh pocket and a hand grip. 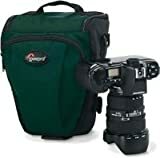 This bag it great for carrying around my D300 with 24-70 combo. Won't fit with the hood installed; that must be stowed in inverted position. Also, I'm guessing that this bag wouldn't work with a grip. But, this is the bag I use to carry the camera around because it's not bulky and offers protection for my setup.